Get a taste of what to expect on our wondrous Finnish adventure as we follow Jones Around the World and his mission to achieve his ‘not yet’ of 2019: husky sledding and witnessing the Northern Lights. This snowy wilderness is one of pure, untouched beauty and (as you’ll see) provides a landscape that’s perfect for exciting and adventurous activities – few of which can be experienced beyond the Arctic Circle. Our Finland adventure to the snowy outback may be short, but it’s packed to the brim with bucket-list hits. 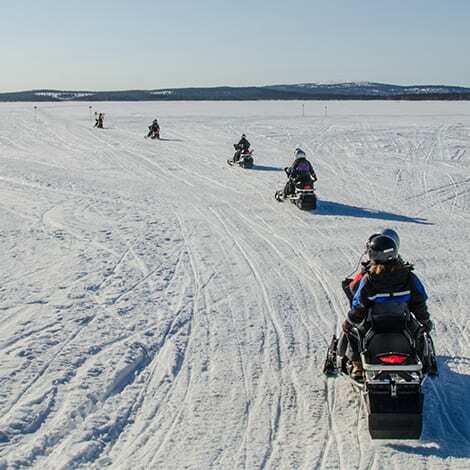 Rev full throttle on a fleet of snowmobiles, as you safari by twilight beneath the dancing Northern Lights. Join us as we yowl with the huskies and sled through the trees, in a blur of dazzling white beauty. Gear up for a lesson in cross-country skiing and glide free across the wintry horizon. Grab a dash of childhood wonder with a reindeer sleigh ride in a Narnia-style forest, before meeting the herders over a fireside lunch in a traditional Lappish kota. This is your chance to drink in the pure Arctic Circle air and the clearest skies in Europe, as you conquer the elements with a host of fresh experiences. Whether you’re basking in a lakeside sauna, toasting fireside marshmallows or gazing up at the flashing green sky, this trip will take your icy breath away. These brilliant insulated domes, perched on the edge of frozen Lake Torassieppi, come with log fires, cosy beds, rugs and plenty of blankets. An unrivalled Northern Lights experience – especially when you’re wrapped up in a blanket with a glass of prosecco in your hand. Huddle down in peaceful wooden chalets with log burners on the shores of Lake Torassieppi. This 19th Century farm complex is spectacularly located amid snow-clad fir trees and the frozen lake. We love the toasty saunas and the restaurant’s roaring log fire. After a hearty breakfast, we’ll explore the pristine snow-laden landscape with a cross-country skiing session. After a quick lesson, you’re free to test your newfound skills on a scenic route of well-maintained tracks. Then, we’ll replenish ourselves with a warming lunch by the roaring fire of a traditional Lappish kota. Be sure to fuel up, then get set for some serious cuteness this morning as we visit a husky farm, where there may even be some husky puppies to cuddle if you’re lucky. We’ll then get to see these lovely Siberian dogs in action on a dazzling nine-kilometre husky safari. A highlight of the trip for many of our Flashpackers, enjoy slicing through the trees pulled by dashing huskies as you steer them through the magical landscape. Come evening, another sumptuous dinner beckons before we head out into our winter playground on a fleet of snowmobiles. Rev up your engine and blaze across the endless white tundra by night, in search of those dazzling Northern Lights. After breakfast, we’ll help you realise a childhood fantasy just a few minutes down the road, at the local reindeer farm. Jump aboard for a magical reindeer sled ride amid snow-clad pine trees and a vast snowy horizon. Afterwards, you’ll be able to chat to the herders about their lives and explore a Lappish manor house. We’ll then head to the restaurant for a hearty lunch. Feeling full and relaxed, we’ll then kick back at an arctic spa where you can unwind amid the steamy warmth of a traditional Finnish sauna. Feeling brave? Go from one extreme to another, with a bracing ice swim. We’ll then gather for a farewell dinner. Feast upon hearty Finnish dishes in the warm glow of the restaurant, savouring your last night of cosy escapism. Note: To squeeze every last minute out of those glorious Northern Lights, we offer the option of upgrading to an Aurora Dome* on your last night, where you can sleep beneath the greenish Arctic skies with a glass of Prosecco in hand. These are chalet-style pods that keep in all the heat, while offering a front-row seat to the skies. You have comfy beds, a wood-burning stove, and spectacular views of the frozen Lake Torassieppi. Speak to our team to find out more. Fly into and out of Kittilä Airport. If you can, arrive before 4pm in time for your welcome meeting (although we would still arrange an airport transfer for you any time you arrive). You can depart anytime at the end of the trip. Finding flights for this northwards voyage to the Arctic Circle can be a little difficult. Please let us know if you are struggling and we will do our very best to help. You need to have a driving licence from your home country in order to drive a snowmobile. Otherwise, you can still take part but you’ll need to ride pillion.